Thursday 31st July 2014 – 9.45pm – John Hawker. A man has been seriously injured following a fire at a residential property in Old Brookside, Stetchford, Birmingham this afternoon. The fire occurred at around 4.35pm. An ambulance and a paramedic officer attended the scene. A West Midlands Ambulance Service spokesman said: “Crews arrived to find a man who had suffered serious smoke inhalation and also burns to his arm and the top of his head. “The man, believed to be in his early 80’s, received emergency treatment at the scene by paramedics and his condition was stabilised. He was then transferred by ambulance to Heartlands Hospital for further emergency treatment. Unfortunately the man’s injuries were very serious. “It is believed a second man suffered multiple minor injuries breaking into the building to help assist the injured elderly man out of the property. He received treatment at the scene but did not require hospital treatment. Thursday 31st July 2014 – 3.20pm – Claire Brown. 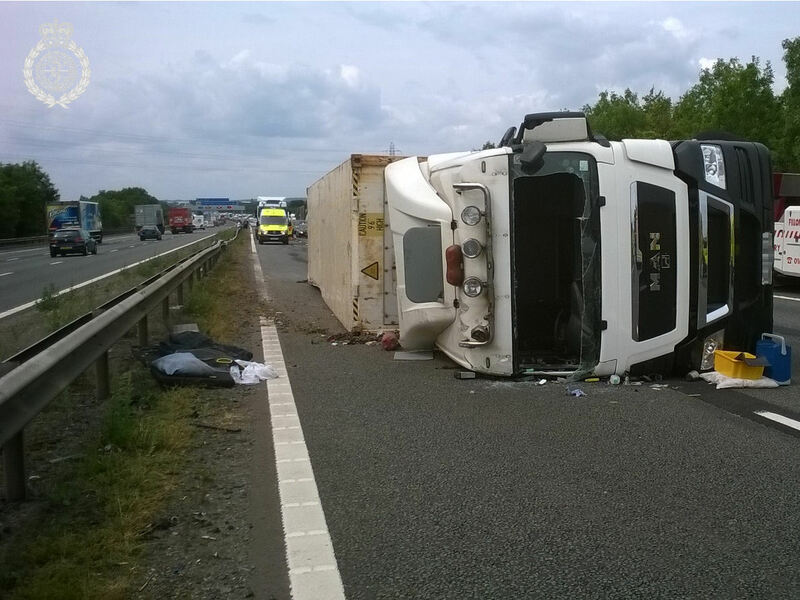 A lorry has ended up on its side on the M6 in Warwickshire leaving one man requiring hospital treatment this afternoon. West Midlands Ambulance Service received a 999 call to the southbound carriageway of the M6 between junctions 2 and 1 shortly before midday (Thursday). An ambulance and a senior paramedic officer attended the scene. A West Midlands Ambulance Service spokeswoman said: “The lorry had landed on its side, blocking lanes two and three of the southbound carriageway. The driver, a man in his 50s, was trapped inside the cab. “Upon assessment ambulance staff found that the man had sustained shoulder, neck, back and rib pain in the collision. He was given intravenous pain relief to stabilise his condition by ambulance staff whilst the fire service worked to extricate him from the vehicle by removing the windscreen. Thursday 31st July 2014 – 12.00noon – Claire Brown. Centro staff now have the skills and life-saving kit to ‘shock’ passengers back to life thanks to West Midlands Ambulance Service and the British Heart Foundation. Midlands Centro recently purchased ten automated external defibrillators (AEDs) from the British Heart Foundation. West Midlands Ambulance has donated a further life-saving device to complete the project which will see a defibrillator based at all ten bus stations as well as Centro’s head office in Birmingham City Centre. The introduction follows a cardiac arrest at Wolverhampton Bus Station last year where a passenger was saved with a defibrillator from the nearby railway station. Over the last few months, the Trust has trained bus staff in basic first aid, CPR and the use of the defibrillator to make sure they’re ready to help if someone suffers a cardiac arrest. 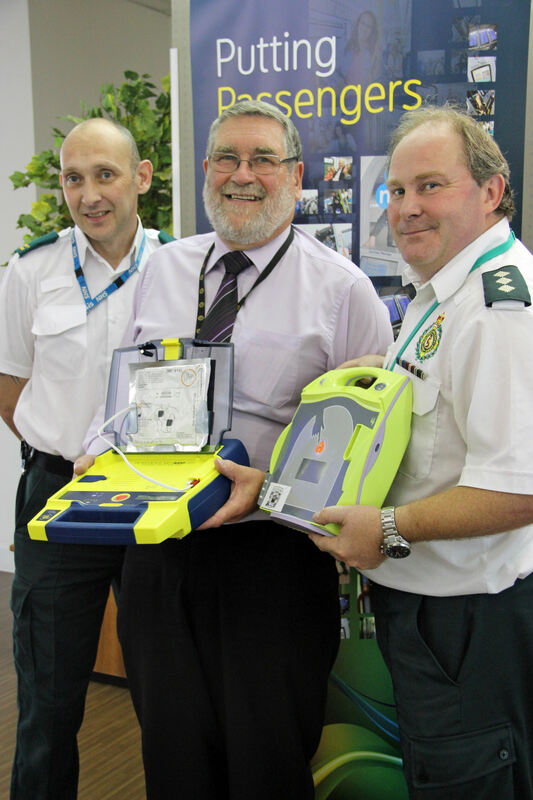 Pictured (left to right): Community Defibrillator Facilitator Stuart Grainger, Centro’s Dave Hadley and Community Response Manager Andy Jeynes. The new defibrillators are based at Centro’s ten bus stations in Bilston, Coventry, Dudley, Halesowen, Merry Hill, Stourbridge, Walsall, Wednesbury, West Bromwich and Wolverhampton. Centro’s head office in Birmingham also houses a defibrillator. Thursday 31st July 2014 – 11.30am – Claire Brown. A man has miraculously escaped serious injury after the lorry he was driving left the road and demolished a wall, a tree and a telegraph pole before coming to rest in a front garden in Stoke-on-Trent this morning. West Midlands Ambulance Service was called to the A53 Leek Road in Endon shortly after 10.00am (Thursday). Two ambulances and paramedic area support officer, Kevin Errington, attended the scene. 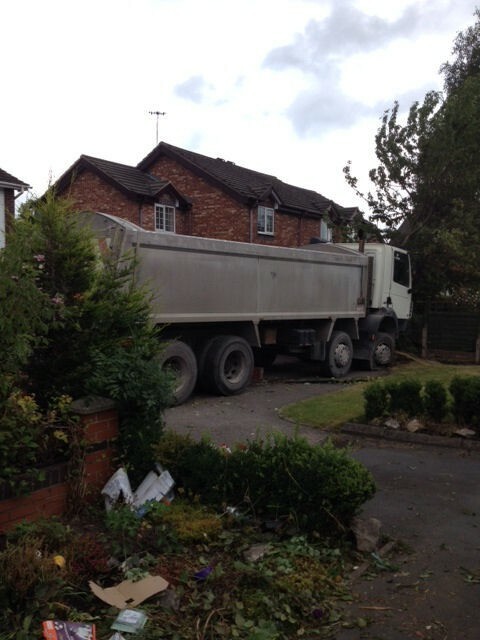 A West Midlands Ambulance Service spokeswoman said: “Crews arrived to find a lorry in the front garden of a property. A wall, tree, telegraph pole and various other items had been damaged in the collision. Thursday 31st July 2014 – 10.00am – Claire Brown. Whether it was the Green Cross Man, Alvin Stardust or two little hedgehogs that taught you how to cross the road, we’re reminding parents and children alike to stop, look and listen. In 2012, the Department for Transport recorded 25,218 road traffic collisions involving pedestrians with 5,979 resulting in death or serious injury. Worryingly, 26% of pedestrians killed in 2012 were aged under 16. 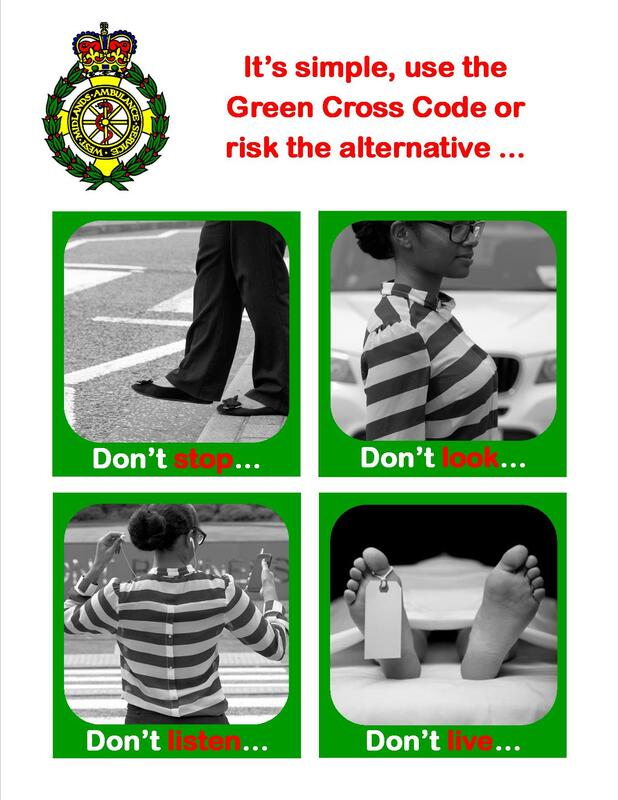 The Green Cross Code is easy. Find a safe place to cross, stop before you get to the kerb, look all around for traffic, listen for traffic, when it’s safe go straight across the road – do not run. Always use a pavement or path along the side of the road if provided. Where possible avoid being next to the kerb with your back to the traffic. If there is no pavement, keep to the right-hand side of the road so that you can see oncoming traffic. Be prepared to walk in single file on narrow roads or in poor light and keep close to the side of the road. Help other road users to see you. Wear/carry something light-coloured, bright or fluorescent in poor daylight conditions. When it’s dark, use reflective materials which can be seen by drivers using headlights. Young children should not be out alone on a pavement or road. When taking children out, keep between them and the traffic and hold their hands firmly. When pushing a young child in a buggy, do not push the buggy into the road when checking to see if it is clear to cross, particularly from between parked vehicles. 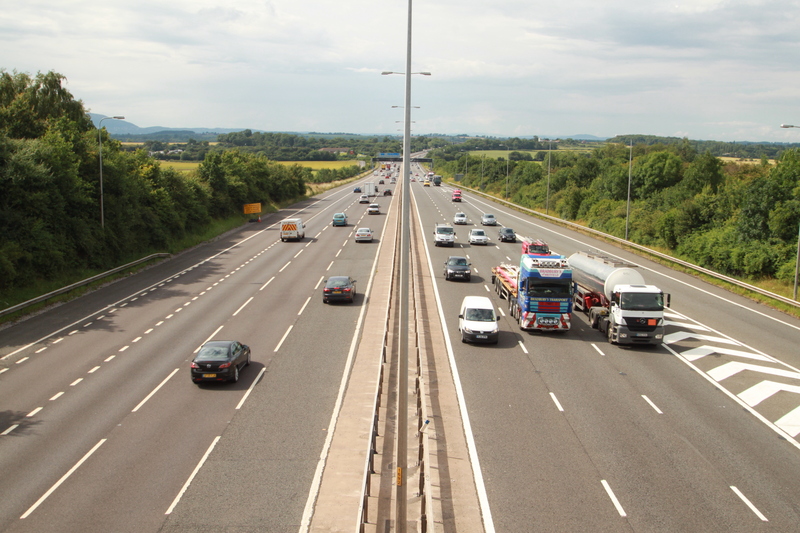 Pedestrians MUST NOT be on motorways or slip roads except in an emergency. Visit www.gov.uk to read more rules for pedestrian in The Highway Code. For helpful advice, quizzes and tips about road safety visit think.direct.gov.uk/. Wednesday 30th July 2014 – 10.15am – Jamie Arrowsmith. As part of its’ Road Safety Week, West Midlands Ambulance Service is urging all cyclists to take a number of simple steps to help them avoid getting into trouble when out and about on the region’s roads this summer. With extended daylight hours there is plenty of chance to pop out on two wheels before work or enjoy a leisurely cycle once your day is complete, that is of course, if you haven’t taken the healthy option of riding to work. But whatever your reason for wanting to get out on your bike, there are a number of simple steps you can take to stay safe. It is an individual choice whether you wear a helmet or not, but as an ambulance service we recommend you do because in our experience, it can help to reduce the risk of a head injury if you come off your bike. Always wear reflective clothing to make yourself visible, make sure you have lights on your bike – especially if riding at night, respect the road and its rules, position yourself well and keep your bike well maintained. 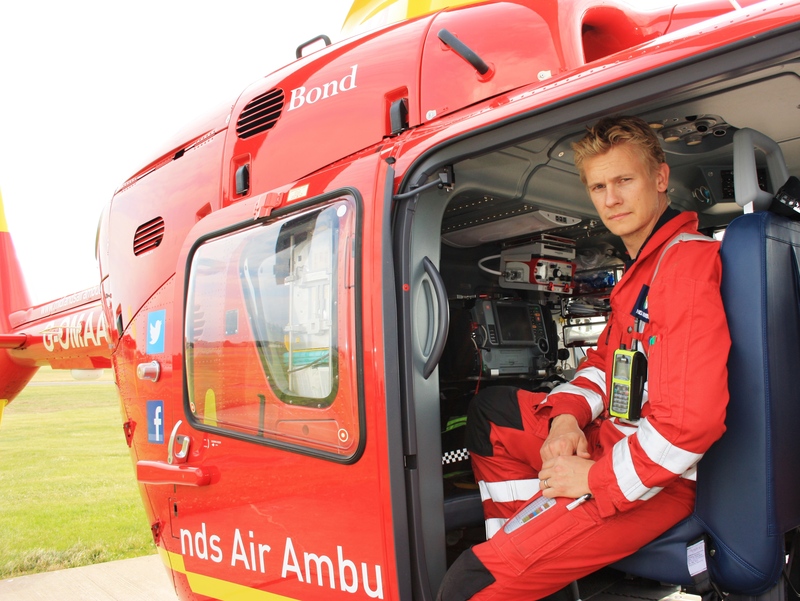 Nick Crombie, Medical Lead for Midlands Air Ambulance, said: “I can’t see any reason why someone wouldn’t want to wear a cycle helmet, it just makes perfect sense to me doing this job, but whether people do or not is entirely an individual decision. “Children, however, are not as aware of traffic, they’re not aware of the rules of the road and the highway code as well as adults are, and they end up disproportionately having more cycling accidents than any other age group. 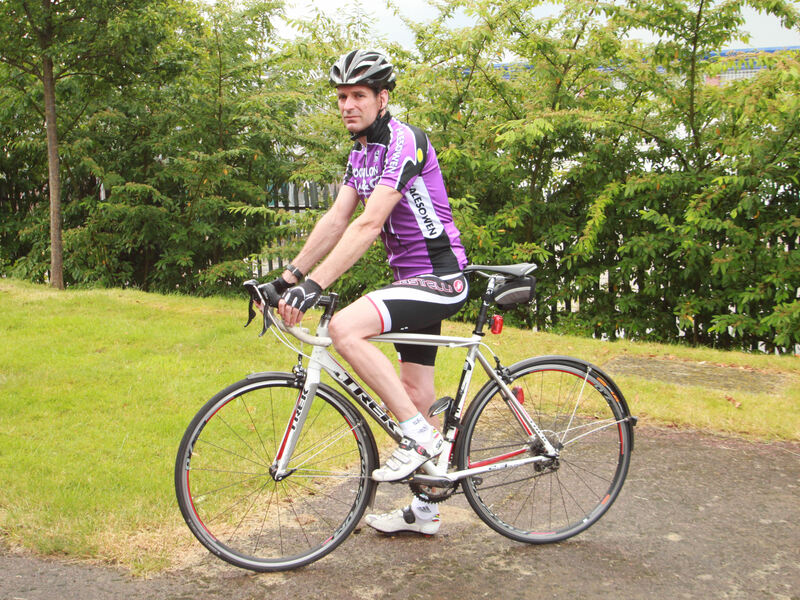 Top picture – Cycling Paramedic Ian Phillips. 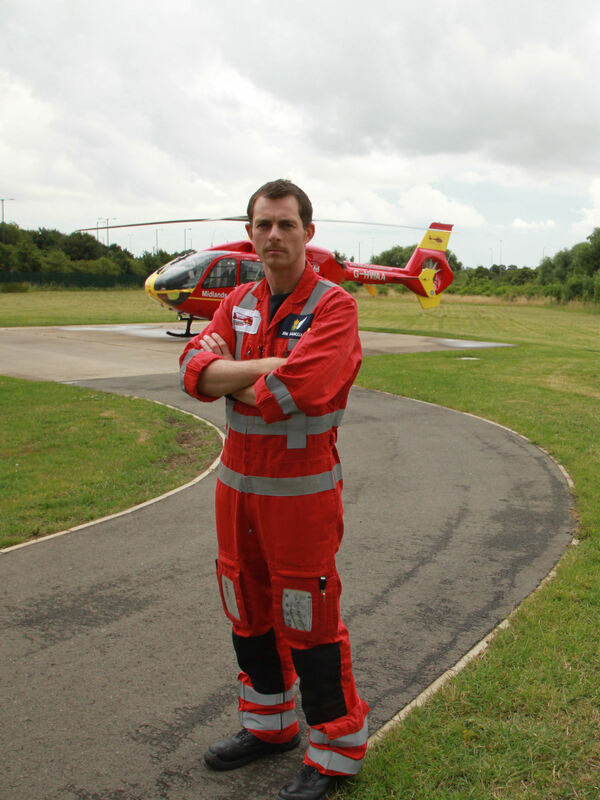 Bottom picture – Midlands Air Ambulance Medical Lead Nick Crombie. Please credit West Midlands Ambulance Service if using either photo. Tuesday 29th July 2014 – 3.30pm – Claire Brown. One of Birmingham’s much loved ‘Emergency Bikers’ is hanging up his leathers later today after more than 36 years’ service. 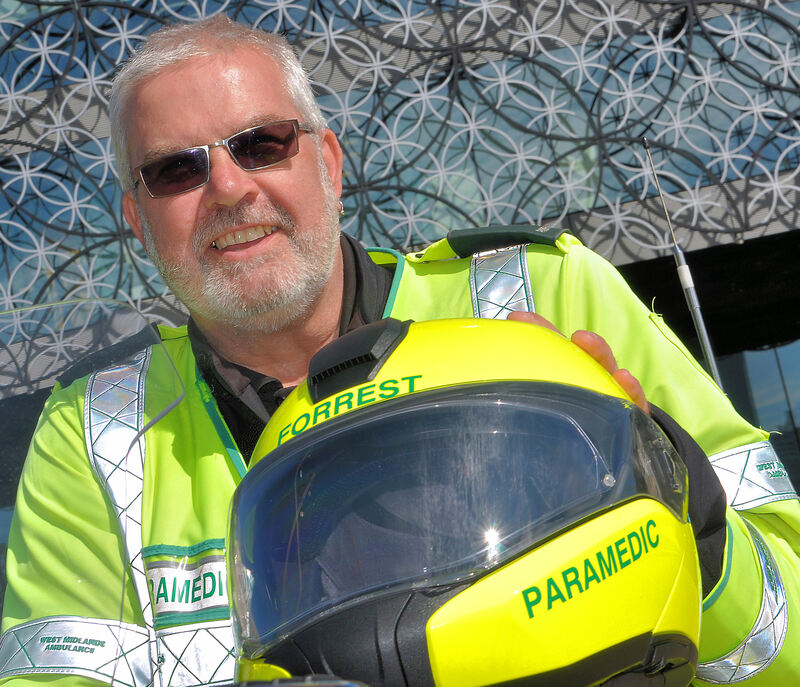 Motorcycle Paramedic Steve Harris, affectionately known as Forrest by colleagues as well as fans of Channel 5’s Emergency Bikers, is working his last shift today before he officially retires from the service. 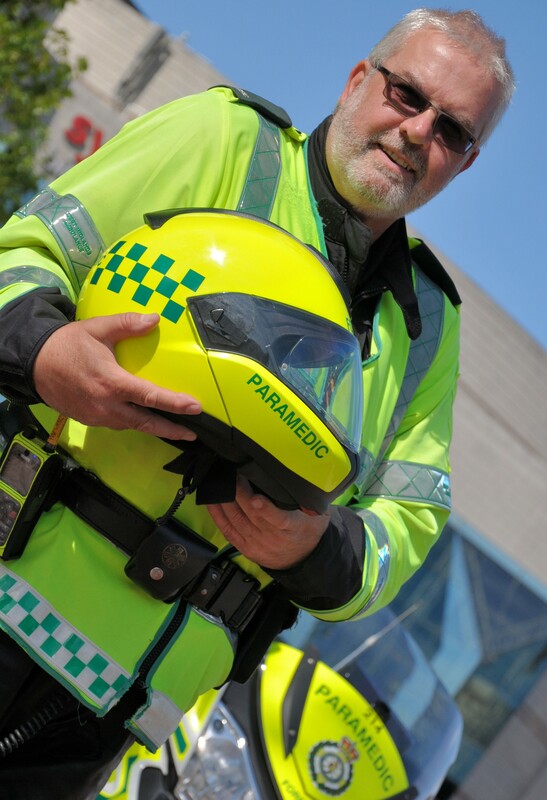 He joined the Trust in 1978 and has worked an impressive 18 years as a motorcycle paramedic. 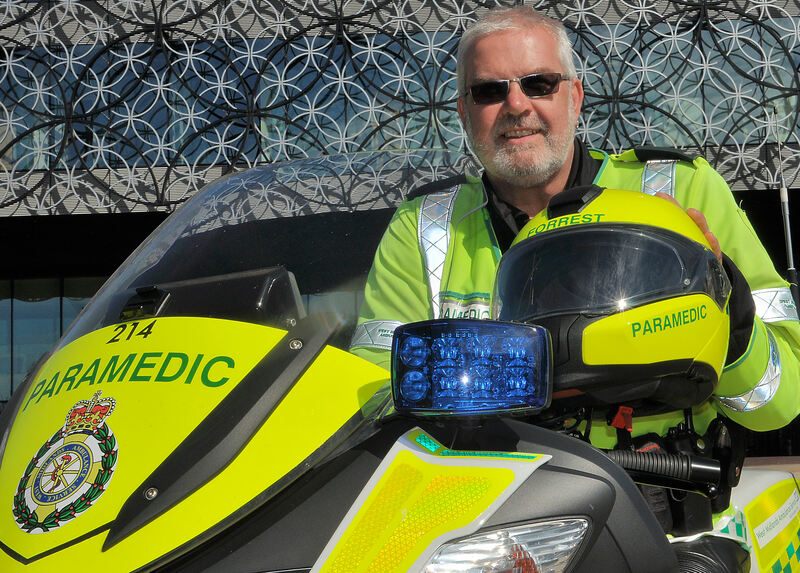 Over the years Steve has provided patient care to thousands of people in Birmingham City Centre and beyond. Despite the decision to take life at a slower pace from now on, Steve can’t quite let go just yet and will be returning later in the year to be a part time biker paramedic. Talking about his last full time shift earlier today, Steve said: “I’ve got mixed feelings about today; it’s going to be a bit of a wrench clocking off tonight. Being officially retired is going to be something different for me to get used to. Tuesday 29th July 2014 – 1.00pm – Suzie Wheaton. Ambulance crews within Staffordshire will be battling it out on the football field this weekend in a bid to raise money for charity. The event which will take place on Sunday 3rd August, will see two teams (North and South Staffordshire) made up of ambulance staff from a variety of roles and ranks within the service all coming together to raise funds for the Queen Elizabeth Hospital Charity. The Charity was chosen as one of the team members, Dave Minard, a paramedic within the division, received tremendous treatment at the hospital after being diagnosed with advanced colorectal cancer. Dave was diagnosed back in 2012 at the age of 31. Despite undergoing treatment and a number of major operations Dave has taken on a variety of challenges including a sky dive and more recently a three peak challenge, where he and a team of paramedics scaled three of the highest mountains in Britain. So far Dave and his ambulance service colleagues have managed to raise over £5,500 for the hospital’s Charity. Stafford father of two, Dave said: “My diagnosis came as a complete shock. I have always led an extremely healthy lifestyle, exercising most days and maintaining a good diet but cancer isn’t picky. 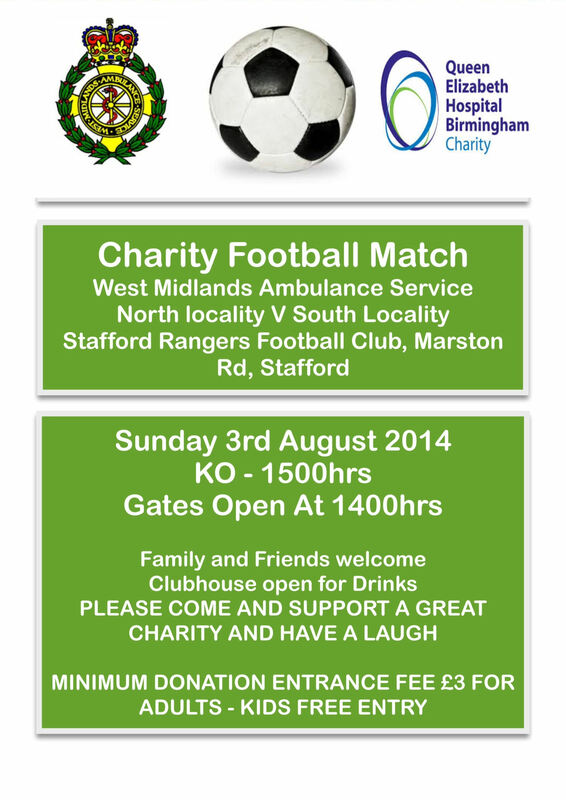 The tournament will kick off at 3pm at the Stafford Rangers Ground, on Marston Road in Stafford. Gates open from 2pm. A £3 donation is asked from adults attending the match (kids go free) which is payable on the day. Why not show your support and pop along to cheer on our staff whilst helping to raise money for a good cause. Tuesday 29th July 2014 – 10.00am – Claire Brown. The law hasn’t changed; West Midlands Ambulance Service is reminding motorists to buckle up and hang up before every trip. Almost 30 years ago it became compulsory for drivers and passengers to wear seatbelts and nearly 11 years ago it became an offence to use a hand-held mobile phone whilst driving. The law hasn’t changed yet some people still think it’s acceptable to risk their lives and those of others. Jim Hancox, a paramedic and an aircrew supervisor with Midlands Air Ambulance, said: “We see probably the more serious spectrum of patients on the aircraft as we often get called to the most serious road traffic collisions. We’re fortunate in the West Midlands now to have three major trauma centres where we can take these patients, if they survive the initial accident, to get good care and rehabilitation. If the picture of Jim Hancox is used, please credit West Midlands Ambulance Service. Monday 28th July 2014 – 11.25pm – Murray MacGregor. A young girl has been taken to hospital with a brake lever embedded in her leg after a freak accident in Birmingham. An ambulance, the Midlands Air Ambulance from Strensham and the MERIT Trauma doctor were sent to the scene. A West Midlands Ambulance Service spokesman said: “The youngster was riding when she fell from her bike and unfortunately the left side brake lever went into her thigh. “The first crew on scene requested firefighters come and remove the handlebars from the bike so that the lever could be kept in place as she was taken to hospital. “The girl was given pain relief and sedated by the doctor before he travelled with her to Birmingham Children’s Hospital where the lever could be removed. Monday 28th July 2014 – 6.18pm – Murray MacGregor. A woman has been airlifted to a major trauma centre with potentially life threatening injuries after a collision with a car. The crash happened at about 4.30pm at the junction of the Wolverhampton Ring Road and Waterloo Road. An ambulance, a rapid response vehicle, a paramedic officer and the Midlands Air Ambulance from RAF Cosford, which was carrying two MERIT trauma doctors on board were sent to the scene. Another ambulance came across it and stopped to offer assistance. A West Midlands Ambulance Service spokesman said: “The Trust received no fewer than 11 999 calls about the incident. “Unfortunately, the woman pedestrian who was estimated to be in her 20s had suffered very serious injuries. 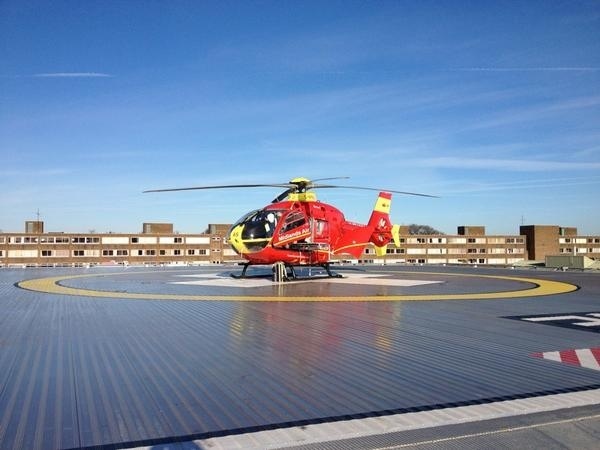 “Due to her condition, she was anaesthetised at the scene before being airlifted to the major trauma centre at the Queen Elizabeth Hospital Birmingham where medics were on standby to receive her. “On departing the scene, she was said to be in a critical condition. Monday 28th July 2014 – 5.20pm – Suzie Wheaton. 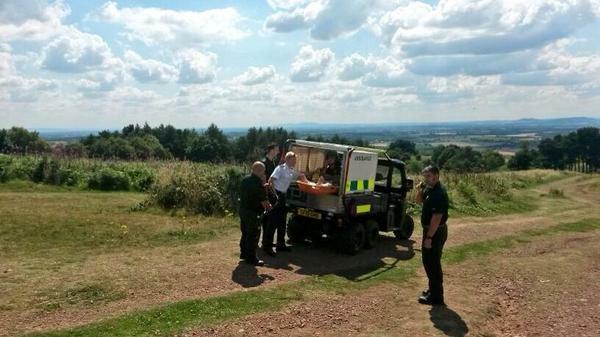 A man became stranded after he injured his leg on top of Clent Hills this afternoon. 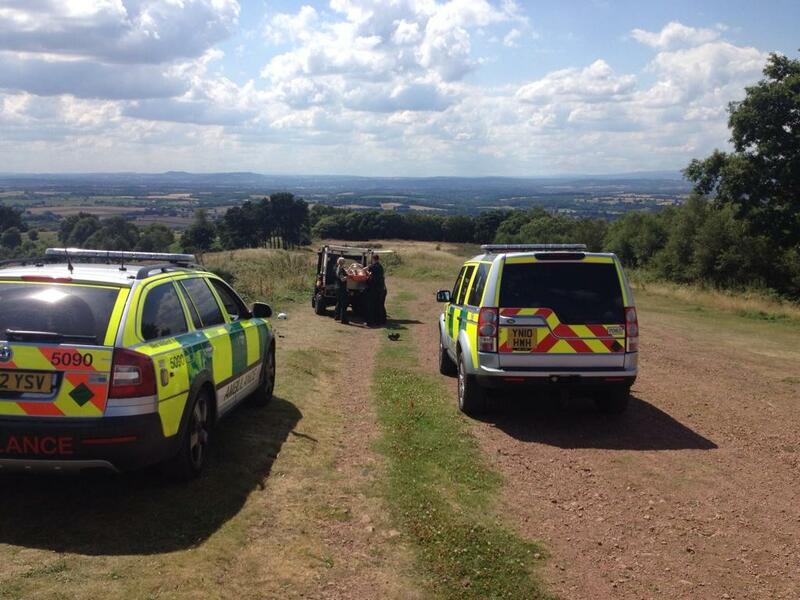 West Midlands Ambulance Service received a call to the ‘four stones’ at the summit of Clent Hills in Clent, Stourbridge at approximately 1.20pm this afternoon. An ambulance, a rapid response vehicle and the hazardous area response team (HART) attended the scene. A West Midlands Ambulance Service spokeswoman said: “A paramedic arrived at the scene to find a man believed to be in his 40’s, who had sustained an injury after his leg had reportedly fallen into a hole. The man, who couldn’t bear weight on his leg, was given pain relief and was treated for a suspected fractured ankle. “Due to the location of the incident the Hazardous Area Response Team deployed their 6×6 all-terrain vehicle to safely bring the man down to the awaiting ambulance, which was located in the car park at the bottom of the hill. The prestigious award for the supply of pre-hospital defibrillators to West Midlands Ambulance Service has been awarded to ZOLL® Medical UK Ltd. The decision was made after a thorough evaluation of the ZOLL X Series® monitor/defibrillator by the clinical team at West Midlands Ambulance Service. The award will see the ambulance service replace all of its existing monitors with the latest technology from ZOLL. Weighing less than 6 kilograms, the X Series is half the size and half the weight of most full-featured defibrillators, yet powerful and built to the most rigorous standards for ruggedness. The X Series has every advanced monitoring and communication capability required by a leading ambulance service. 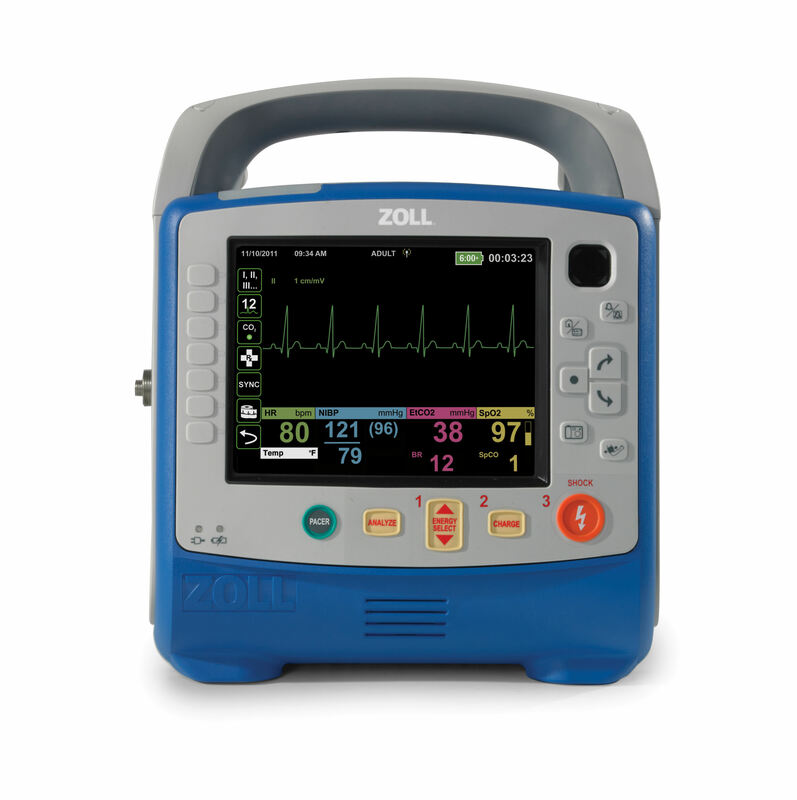 For more information on X Series please visit www.zoll.com or call 01928 595 160. Monday 28th July 2014 – 10am – Claire Brown. 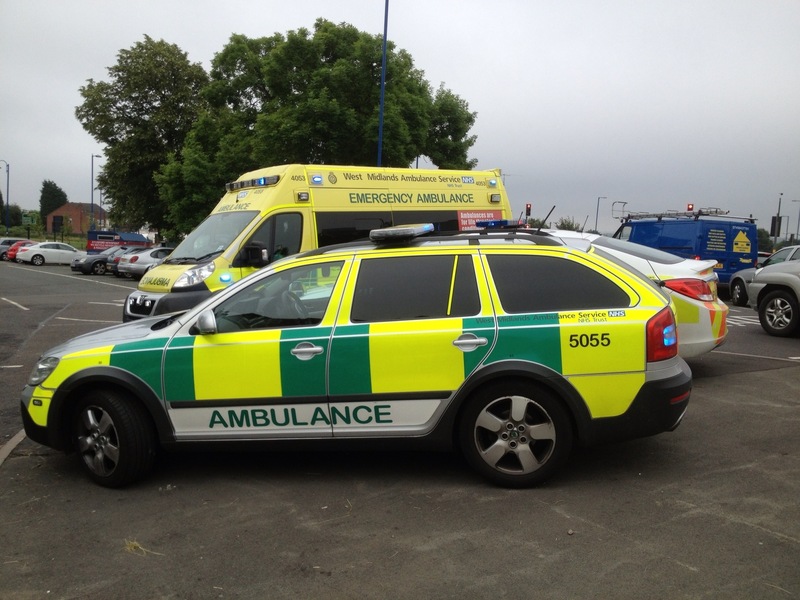 As part of a four-week Summer Safety campaign, West Midlands Ambulance Service is urging everyone to take extra care when using the region’s roads. In 2013, ambulance staff and medics from the Trust attended more than 16,000 road traffic collisions across the West Midlands; that’s on average 300 a week. Figures from the Department for Transport state that across the UK last year there were 138,660 road accidents reported to the police. Worryingly, 1,713 of those resulted in a fatality. Over the course of this week, West Midlands Ambulance Service will be offering advice to road users through a collection of press releases, videos and facts in a bid to help members of the public avoid becoming a patient in the back of one of our ambulances. As well as hearing from our paramedics and doctors who regularly deal with road traffic collisions, members of the public will also offer their views, advice, experience and opinions. Whether you choose a car, bicycle, motorbike or your own two feet to get around our region’s roads this summer, use common sense to avoid becoming a statistic. Sunday 27th July 2014 –8.10pm – Suzie Wheaton. 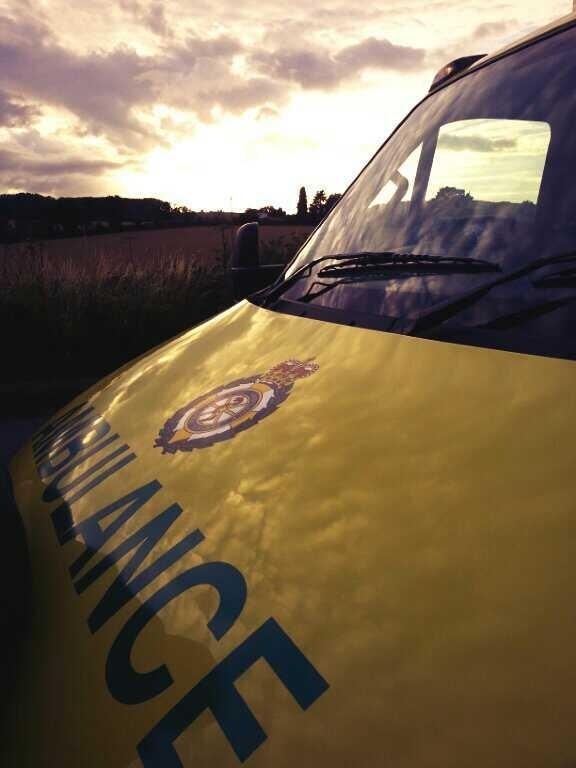 Three people were given emergency medical treatment following an incident in Staffordshire last night. West Midlands Ambulance Service was called to a field near to the Cannock Chase visitors Centre, off Marquis Drive in Brindley Heath shortly after 11.35pm yesterday (Saturday) evening. Three ambulances, a rapid response vehicle and an ambulance officer were dispatched to the scene. The police and fire service also attended. A West Midlands Ambulance Service spokeswoman said: “On arrival at the scene, crews found a car that had overturned and was upside-down in a field. “Emergency services worked closely together to ensure that all the occupants from the vehicle were released safely. “The three occupants, all believed to be in their early 20’s, were assessed by ambulance crews at the scene. “One man was treated for shoulder and abdominal pain before being conveyed to New Cross Hospital. “A second man was treated for a head injury and back and neck pain before he was taken to Walsall Manor Hospital. “A woman was also treated for a head injury, as well as back and neck pain before being taken to the major trauma centre at University Hospital of North Staffordshire. Sunday 27th July 2014 – 1.10am – Suzie Wheaton. 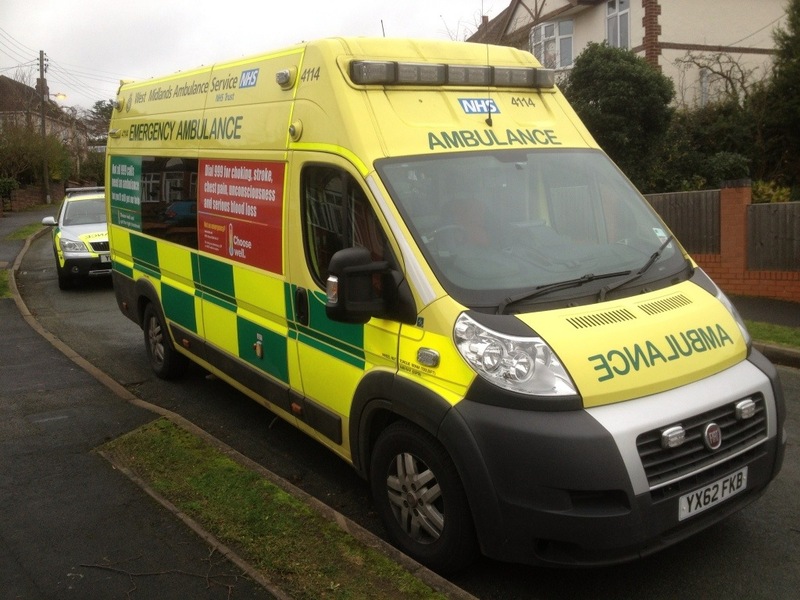 Ambulance crews rushed to the scene of an explosion in a house in Black Country yesterday. West Midlands Ambulance Service dispatched an ambulance and a paramedic area support officer to the incident on The Straits in Lower Gornal at approximately 8.00pm yesterday evening (Saturday). The police and fire service were also in attendance. A West Midlands Ambulance Service spokeswoman said: “Crews were called to reports an explosion in a house. On arrival at the scene medics found the front window of the property lying in the garden after a gas cylinder was reported to have exploded inside of the house. A door within the property was also found to have been blown off its hinges. Saturday 26th July 2014 – 7.00pm – Suzie Wheaton. A teenage pedestrian received emergency medical treatment after being in collision with a car this afternoon. West Midlands Ambulance Service dispatched an ambulance and a rapid response vehicle to the incident on Astwood Road in Worcester at approximately 3.30pm today. A West Midlands Ambulance Service spokeswoman said: “Crews arrived to find a car and a pedestrian that had been in collision. Friday 25th July 2014 – 10.25pm – Suzie Wheaton. A car carrying a woman and four children collided with a motorway central reservation in Shropshire today. West Midlands Ambulance Service was called to junction 6 of the M54, Eastbound shortly after 3.35pm this afternoon. Three ambulances, a paramedic area support officer and a BASICS doctor were dispatched to the scene. A West Midlands Ambulance Service spokeswoman said: “Crews arrived on scene to find a vehicle that has collided with the central reservation. “The car had been carrying a woman and four children at the time of the incident. “The driver, a woman in her 30’s, was treated for seat belt injuries, an arm injury and neck pain. The woman was immobilised and emergency services worked together to safely extricate her from the vehicle as a precaution. “The four children were assessed at the scene. Two were treated for minor injuries whilst the other two were found to be uninjured. Friday 25th July 2014 – 5.15pm – Claire Brown. West Midlands Ambulance Service can confirm that it was called to a police incident on Newton Road, near the village of Newton at 11.45am this morning. A paramedic area support officer and a responder paramedic were sent to the scene. Ambulance staff later cleared from the incident at 1.00pm. Due to the nature of the incident and on-going police investigation it would be inappropriate to comment further. Warwickshire Police would like to hear from anyone who saw any cars driving erratically in the Newton area, in particular on the A5. Warwickshire Police can be contacted via the non-emergency police number 101. Newton Road remains closed between Newton and the crossroads with Newton Manor Lane at the St Thomas Cross Inn. Notes to Editor: Please contact Warwickshire Police for further information. Friday 25th July 2014 – 9.10am – Suzie Wheaton. A man has been treated for minor injuries following a significant collision in which his car left the road. West Midlands Ambulance Service was called to Armorial Road in Coventry shortly before 1am this morning. An ambulance, a rapid response vehicle and two paramedic area support officers were sent to the scene. A West Midlands Ambulance Service spokeswoman said: “Crews arrived to find a car that had left the carriageway, collided with a tree, and had come to rest on a driveway against a parked van and a house, with its bonnet pointing in the air. “With the assistance of the emergency services the driver of the car managed climb out of a rear window of the vehicle to safety. “The man believed to be in his 30’s was treated for a very minor wrist injury at the scene before being conveyed to University Hospital of Coventry and Warwickshire for further assessment and treatment. Thursday 24th July 2014 – 3.40pm – Jamie Arrowsmith. “I dread to think what her injuries might have been had she not been wearing protective clothing,” were the words of a paramedic area support officer who attended a road traffic collision involving a female biker in Staffordshire this morning. The woman, believed to be in her 40s, was involved in a collision with a car near to Swift Service Station on Clayton Road, Newcastle, at 10.25am and although still suffering a number of injuries, her decision to wear protective gear appears to have saved her from a much more serious outcome. West Midlands Ambulance Service sent an ambulance and a paramedic area support officer to the scene. The police were also in attendance. A West Midlands Ambulance Service spokesman said: “Crews arrived to discover a motorbike and car that had been in collision. “The woman riding the motorbike was treated by paramedics for fractures to her arm and wrist whilst she had also suffered rib injuries. She was then taken to University Hospital North Staffordshire for further assessment. A collision involving a van and a lorry on the M6 left three people requiring treatment from paramedics and caused traffic disruption in Coventry this morning. West Midlands Ambulance Service was called to scene on the M6 northbound, between junctions two and three, just before 9.10am and sent three ambulances and a paramedic area support officer to the scene. A West Midlands Ambulance Service spokesman said: “On arrival, crews discovered two vehicles that had been in collision, a van with rear end damage and a lorry with front end damage. The police were also in attendance. “There were three patients in total, all of whom had managed to free themselves from their vehicles. “A 42-year-old man, the driver of the van, was treated for pelvic and leg injuries whilst his passenger, a 30-year-old man, suffered neck injuries. “The driver of the lorry, a 52-year-old man, was treated for chest pain and all three patients were taken to University Hospital Coventry and Warwickshire for further assessment. Once again, we wish to set the record straight after another ‘sensationalist’ article in a local media outlet. As previously stated, Dr Marsh is currently running two ambulance trusts; he does not receive the salary of two Chief Executives. Whilst working in the East of England, he does require accommodation which is governed by NHS Guidelines. On the nights in question, he did stay at Champneys at a rate of £75 per night. He arrived at around 10.30pm each evening and left by 8.00am the following morning and did not use any of the facilities. It is deeply disappointing that the outlet in question should run such a sensationalist headline which suggests that the tax payer is getting poor value for money when the situation could not be further from the truth. The joint role saves the tax payer approx. £130,000 on the cost of a having a substantive Chief Executive in each ambulance trust. In addition, the lowest cost is always sought for his overnight accommodation. By comparison, within the same two areas, there are 11 Chief Fire Officers and 10 Chief Constables. Thursday 24th July 2014 – 11.30am – Chris Kowalik. A boy is considered very lucky after he was pulled from a large pool in Telford by a fisherman. The fifteen year old was among a group of children swimming in Blue Pool when he got into difficulty. Fortunately for him, a fisherman there pulled him out of the water and West Midlands Ambulance Service was called. The call time was shortly after 12.30pm yesterday (Wednesday 23rd July). Rob Marsh, Paramedic and Assistant Area Manager for Shropshire, said: “When the ambulance crew arrived, the boy coughed up one-and-a-half litres of quarry water. “Because of the amount of dirty quarry water he had taken in, there was a danger of ‘secondary drowning’ – in other words, he was in danger of lung spasm and poisoning his own blood because of what was in the water. “He was taken to Princess Royal Hospital to be dealt with by its resuscitation team. A 1980s-themed fancy dress party held at the Dog and Bull in Coton on 27th June has raised £800 for volunteer lifesavers from the North Shropshire Community First Responders. 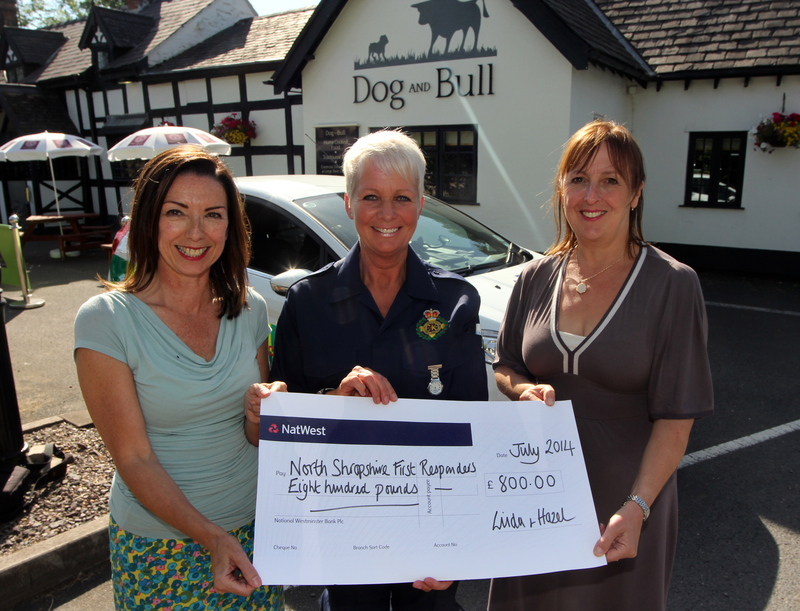 Organisers of the event Linda Grocott and Hazel Ruscoe presented the cheque to First Responder volunteer Lynne Stokes who also works at the Dog and Bull. The event was held in a marquee at the pub and was attended by 150 people who enjoyed live entertainment and a hog roast. The scheme covers all areas of the north of the county including Whitchurch, Market Drayton, Wem and Shawbury. Party organiser Linda Grocott said: “The First Responders volunteers provide a vital emergency service in our community. We are very fortunate to have such a committed and professional team in North Shropshire. It is also very reassuring to know that the team is ready to spring into action when we need their support. Commenting on the donation Gerry Evans, Co-ordinator of the North Shropshire Community First Responders Scheme said: “We rely heavily on generous support from local people to help fund our vehicles and medical equipment. All donations we receive go directly into supporting our local community. The party was also supported by help-in-kind from County Loos and Terry Pritchard of Coton. For further information contact Hazel Ruscoe on 07970 237068. 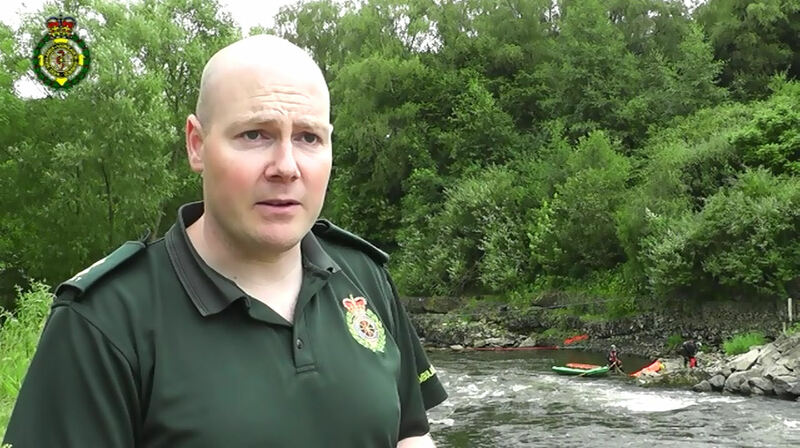 As part of West Midlands Ambulance Service’s week-long water safety campaign, we are highlighting the number of rescues our Hazardous Area Response Team have been involved in. The team attended 59 cases throughout last year. 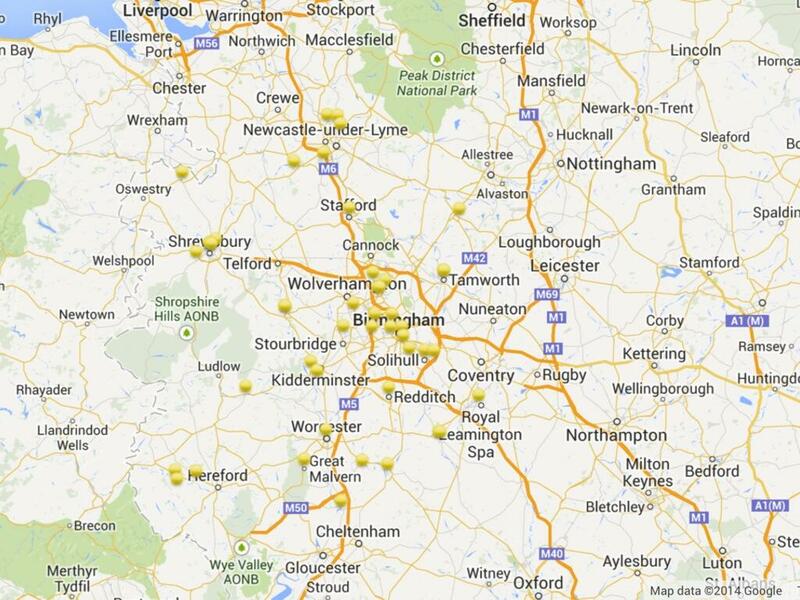 The yellow dots on the map show where those incidents were. Already this year they have been to more than 60; one was a fatality at a quarry. Stay safe. Please don’t become one of our statistics. A woman has been assessed by ambulance staff and released with no injuries after her car was in collision with a shop front near Warwick earlier today. Wednesday 23rd July 2014 – 10.30am – Steve Parry. Two lorry drivers have been treated by ambulance crews following a road traffic collision on the M6 in Warwickshire which left long tailbacks during the morning rush hour. West Midlands Ambulance Service was called to the incident near junction 3a – 3 southbound at just after 8.35am. An ambulance together with a paramedic in a rapid response vehicle and a paramedic officer were sent to the scene. “A man, believed to be in his fifties, was treated for abdominal and chest injuries. He was taken by land ambulance to the University Hospital of Coventry and Warwickshire. Wednesday 23rd July 2014 – 9.15am – Suzie Wheaton. A man has received emergency medical treatment after the car he was travelling in overturned on the M54 in the early hours of this morning. West Midlands Ambulance Service was called between junctions 4-3 of the M54 at approximately 12.40am this morning. An ambulance and a paramedic area support officer were dispatched to the scene. A West Midlands Ambulance Service spokeswoman said: “Crews were called to reports of a car that had been in collision with the central reservation and had overturned. “The car had been carrying a single occupant at the time of the incident. The man who had a reduced level of consciousness was treated for a potential head injury at the scene. He was fully immobilised and conveyed to the major trauma centre at University Hospital of North Staffordshire. Wednesday 23rd July 2014 – 9.10am – Suzie Wheaton. A person has died and two others have been seriously injured following an incident in Stoke on Trent today. West Midlands Ambulance Service was called to a single vehicle collision on Baddeley Green Lane in Baddeley Green shortly after 4.20am this morning. Three ambulances, a rapid response vehicle, a paramedic area support officer and three BASICS doctors were dispatched to the scene. The police and the fire service were also in attendance. A West Midlands Ambulance Service spokeswoman said: “Crews arrived on scene to find a car that had been in collision with a tree. A nearby bollard and a wall were also found to have sustained damage. “Three occupants were believed to have been travelling in the car at the time of the incident. “One of the occupants was found lying in a garden near to the incident. Ambulance crews immediately assessed the patient but unfortunately despite best efforts nothing could be done to save the person and they were confirmed deceased at the scene. “A second patient was also found on the floor outside of the vehicle and was given advance emergency medical treatment for serious multiple injuries. The casualty was fully immobilised and conveyed to the major trauma centre at University Hospital of North Staffordshire. “A third occupant was found trapped inside the vehicle. Ambulance crews worked closely with the fire service to safely extricate the person who was treated for serious head injuries. The patient was conveyed to the same hospital for further assessment and specialist treatment. John Woodhall is West Midlands Ambulance Service’s water safety expert within the Hazardous Area Response Team. In his spare time he goes white-water kayaking. Tuesday 22nd July 2014 – 9.20pm – Suzie Wheaton. A cyclist has been treated for a serious leg injury after colliding with a lorry in Staffordshire this evening. An ambulance, a rapid response vehicle, a paramedic area support officer and two BASICS doctors were dispatched to the incident on Rising Brook in Stafford shortly before 5.35pm this evening. A West Midlands Ambulance Service spokeswoman said: “Crews arrived at the scene to find a cyclist lying on the floor near to a pedestrian crossing, following reports that he had been in collision with a lorry. Tuesday 22nd July 2014 – 12.00pm – Chris Kowalik. 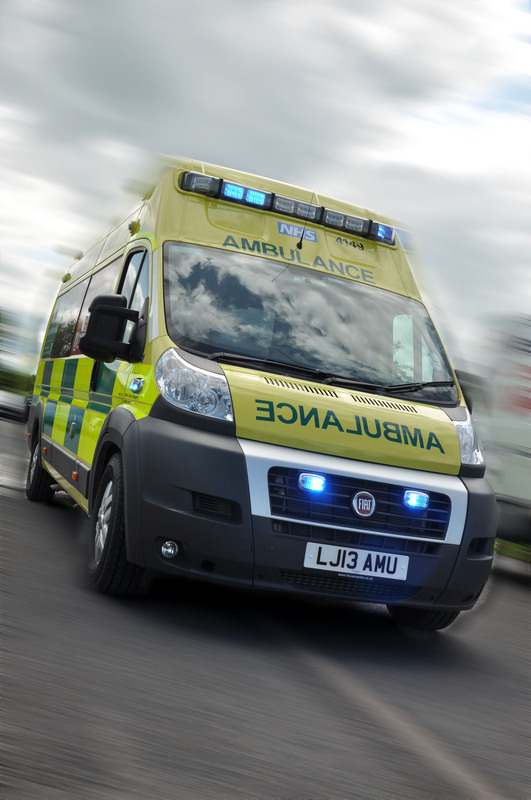 A motorcyclist has been injured in a collision with a lorry in north Staffordshire. West Midlands Ambulance Service was called to the junction of Leek Road and Roughcote Lane between Caverswall and Cellarhead shortly before 6.40am today. A paramedic, a senior paramedic officer, a paramedic area support officer and a BASICS Emergency Doctor attended in rapid response vehicles. An ambulance crew also attended. Our Hazardous Area Response Team (HART) trains regularly in river rescues. As part of our week-long water safety campaign, see what it involves. Monday 21st July 2014 – 8.10pm – John Hawker. 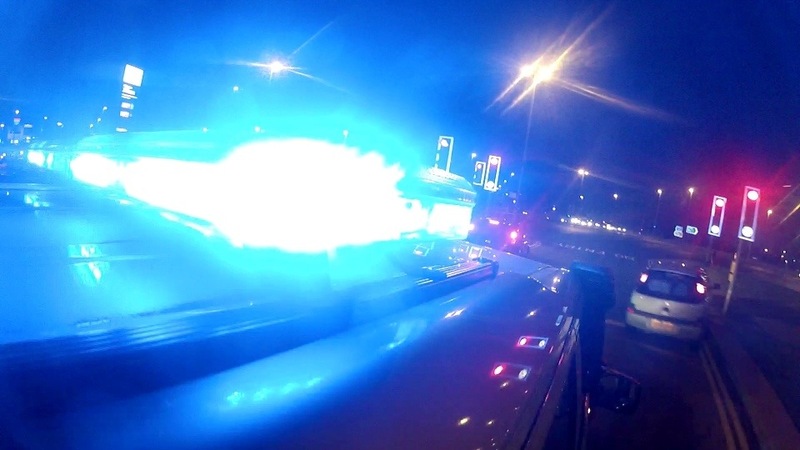 A motorcyclist has suffered serious injuries following an RTC in Birmingham this evening. The crash occurred on Church Hill, Frankley at around 5.30pm. An ambulance, a paramedic officer, a BASICS Doctor and the Midlands Air Ambulance from Cosford attended the scene. A West Midlands Ambulance Service spokesman said: “Crews arrived and found a motorcycle that had been in collision with the rear wheel of a tractor. “The motorcyclist, a man believed to be in his 30’s, had suffered head, chest and leg injuries and had a reduced level of consciousness. “He received emergency treatment at the scene and his condition was stabilised. The man was transferred by land ambulance to Queen Elizabeth Hospital Major Trauma Unit for further emergency treatment. The Doctor travelled on board the ambulance continuing treatment with paramedics. Monday 24th July 2014 – 10am – Steve Parry. On average, more than 400 people drown in the UK each year. Nearly 60 of these are children and young people. Ambulance bosses are therefore urging adults and children not to think about swimming in unsupervised waters this summer. Each year tragedy strikes when children and adults are seriously injured or killed as a result of cooling off in rivers, ponds, canals and abandoned quarries across the region. 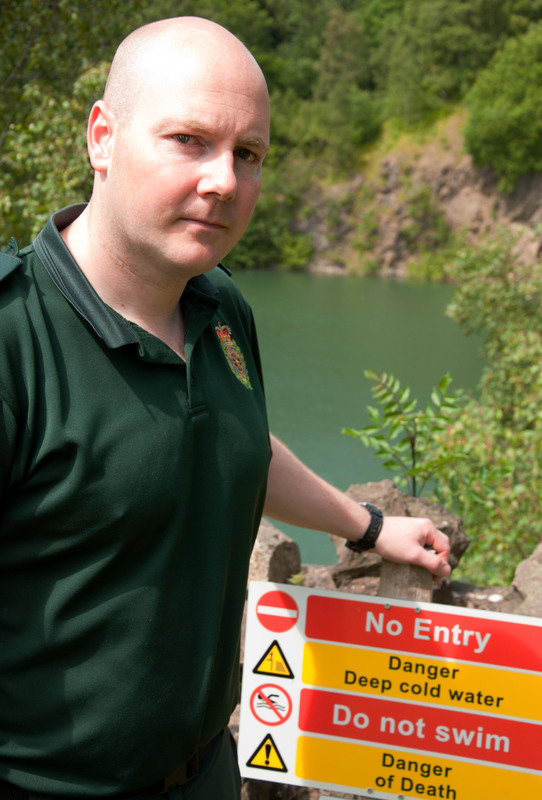 West Midlands Ambulance Service is highlighting the inherent dangers with a public safety campaign geared to educating the public unfamiliar with the hazards that exist at disused water-filled sand and gravel quarries and other stretches of uncharted water. “As schools breaks-up for the summer holidays there are more opportunities to explore the great outdoors,” said John Woodhall, WMAS Hazardous Area Response Team Support Manager. “We want people to stay safe and be aware that rivers, pools, lakes and disused quarries are not recreation grounds and there are no lifeguards coming to the rescue if you get into difficulty. The message from WMAS is clear: ‘Stay Out of the Water’. If you want to cool off this summer, make sure you use a local amenity where lifeguard supervision is present at all times. Sunday 20th July 2014 – 8.35pm – Chris Kowalik. A man has been injured after the sidecar he was in overturned at a grasstrack racing event in Herefordshire. It happened at the ACU British Masters Grass Track Challenge at Orlhams Farm, Leadington. 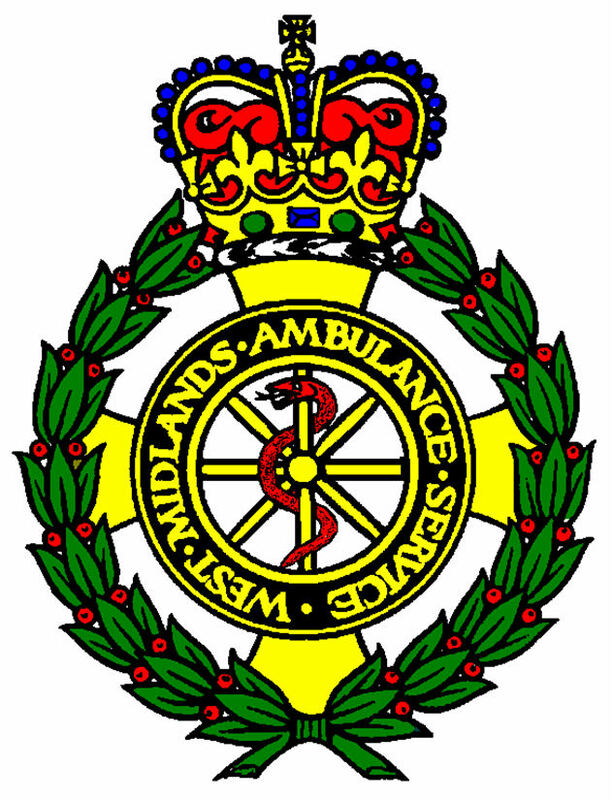 West Midlands Ambulance Service was called shortly after 2.45pm today. An advanced community paramedic in a rapid response vehicle, an ambulance crew and the Midlands Air Ambulance from Strensham attended. A West Midlands Ambulance Service spokesman said: “The man, believed to be in his fifties, had overturned his sidecar. Initially he was treated by the private ambulance that was on scene providing medical cover for the event. Sunday 20th July 2014 – 8.30pm – Chris Kowalik. 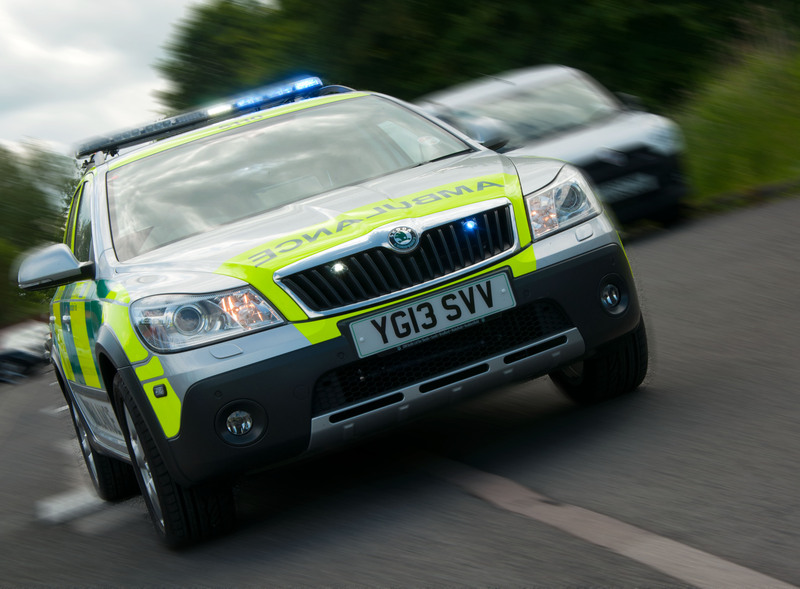 A motorcyclist has been seriously injured in a road traffic collision in Staffordshire. 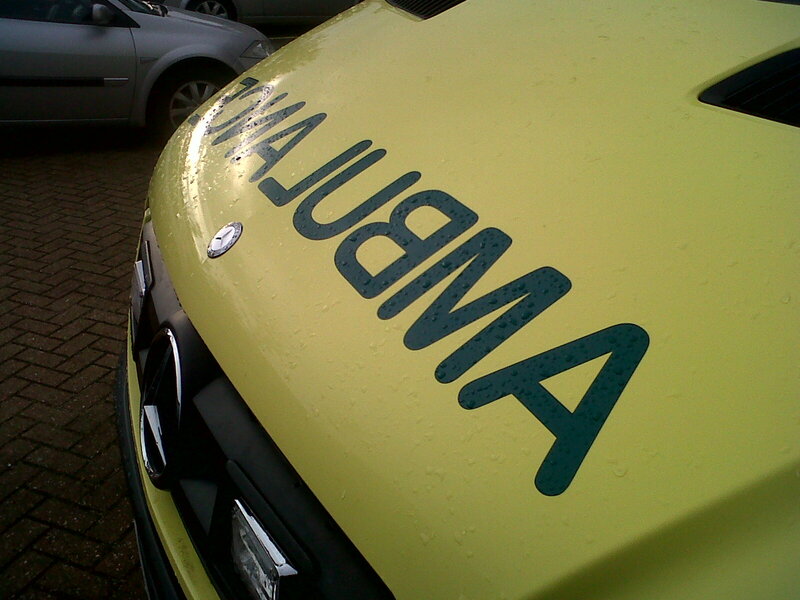 West Midlands Ambulance Service was called to the A38 southbound between Burton and Fradley at 2pm today. A community paramedic in a rapid response vehicle, a paramedic officer in a rapid response vehicle, an ambulance crew and the Midlands Air Ambulance from Cosford attended. A West Midlands Ambulance Service spokesman said: “The motorcyclist, a man in his forties, had come off his bike. He had numerous serious injuries. They include injuries to his chest and abdomen. He had fractured ribs and a fractured leg. A man has escaped serious injury following a collision that badly damaged the car he was driving. 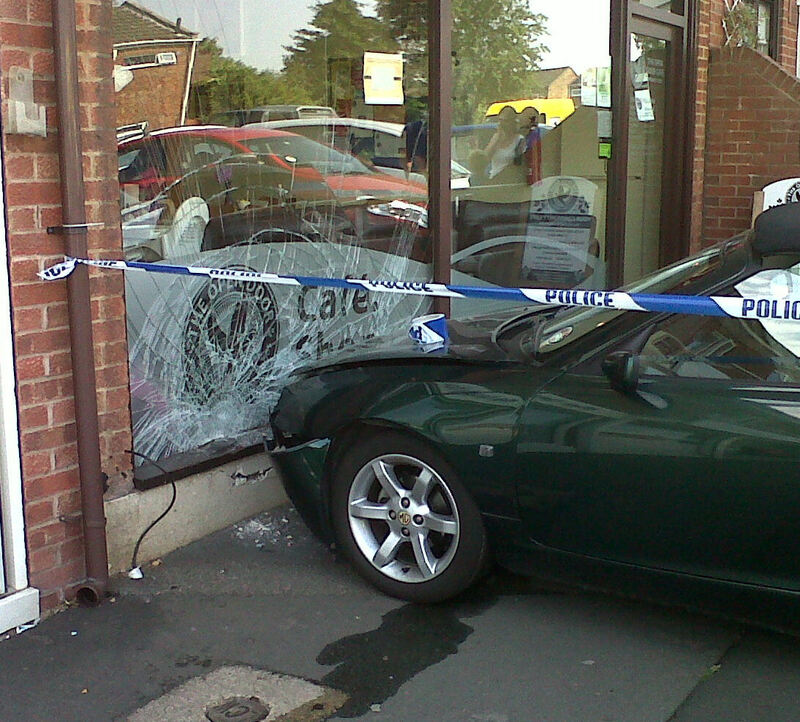 It happened in High Street, Brownhills. West Midlands Ambulance Service was called shortly before 3.30pm yesterday (Saturday). An ambulance crew and a paramedic area support officer attended. The crew of the Midlands Air Ambulance from Cosford also attended by rapid response vehicle – the helicopter was unable to fly during yesterday’s stormy weather. 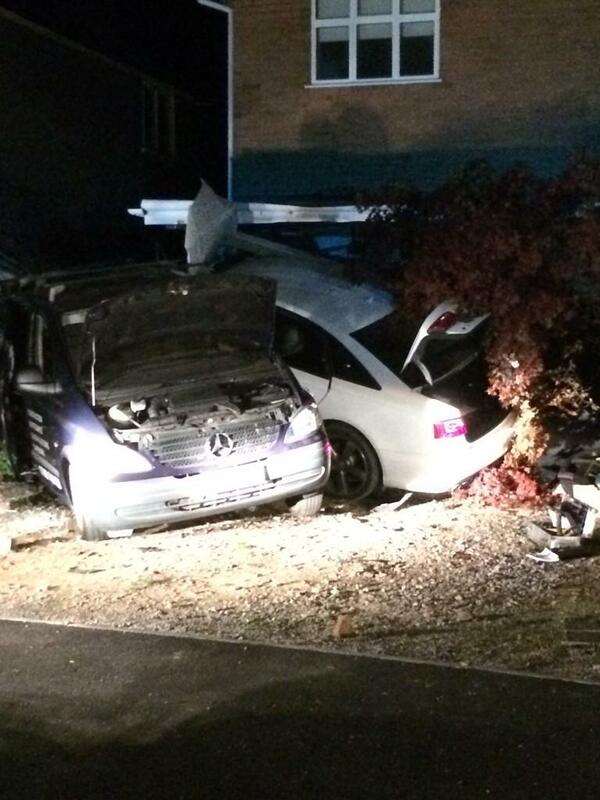 A West Midlands Ambulance Service spokesman said: “There was significant damage to the car. It’s driver, however, just had marks from his seatbelt. One of the crew at the scene remarked at how fortunate he was not to have been more seriously injured. Following a recent newspaper report saying that Anthony Marsh has received a “£50k pay rise”, West Midlands Ambulance Service and East of England Ambulance Service wish to set the record straight. Mr. Marsh’s substantive position is that of Chief Executive of West Midlands Ambulance Service. He is also Chief Executive of East of England Ambulance Service. For the combined work his salary has been increased by £50,000, saving the taxpayer approx. £130,000 on the cost of a having a substantive Chief Executive in each ambulance trust. Mr. Marsh is now responsible for the running of both organisations, doing the job of two Chief Executives. He is not, however, earning the salaries of two Chief Executives. On average, Mr. Marsh works at least 70 hours a week to ensure both areas receive his full attention. West Midlands and East of England Ambulance Services have a combined workforce of almost 9,000 staff, answer approximately 6,000 999 calls every day and cover a combined area of over 12,000 square miles. East of England Ambulance Service was a failing trust. Since his appointment as interim Chief Executive, Mr. Marsh has brought in brand new frontline vehicles and almost 400 new staff. The organisation has turned a corner. West Midlands Ambulance Service is meeting its performance targets this year in very difficult circumstances and despite massive increases in demand. The West Midlands Trust is regularly seeing demand at 10% above that commissioned, but the trust is still performing thanks to the hard work of staff. For 2014-15, Anthony Marsh’s total salary for his work at West Midlands Ambulance Service and East of England Ambulance Service is £232.226. This includes the £50,000 uplift for his additional duties for the East of England trust. Friday 18th July 2014 – 4.40pm – Jamie Arrowsmith. West Midlands Ambulance Service was called to the incident in a field near to Mount Road shortly after 11.25am and sent an ambulance, a community paramedic in a rapid response vehicle and the Midlands Air Ambulance from Staffordshire to the scene. A West Midlands Ambulance Service spokesman said: “On arrival, crews discovered a 50-year-old man who had been thrown over the handlebars of the quad bike, reportedly after hitting a ditch. The quad bike then proceeded to land on the man where he had come to rest following his fall. “He was treated on scene by paramedics for injuries to his chest, shoulder, pelvis and right leg. He was given pain relief and immobilised with the use of a neck collar, scoop stretcher, pelvic binder and leg splint. Friday 18th July 2014 – 1.45pm – Jamie Arrowsmith. There was disruption to both the road and rail networks in Wolverhampton earlier this morning when a skip lorry collided with a railway bridge. West Midlands Ambulance Service was called to the incident in Dixon Street at 10.15am and sent an ambulance, a community paramedic in a rapid response vehicle and two paramedic area support officers to the scene. A West Midlands Ambulance Service spokesman said: “Crews arrived to find a skip lorry that had collided with a railway bridge and emptied its contents across the road as a result. 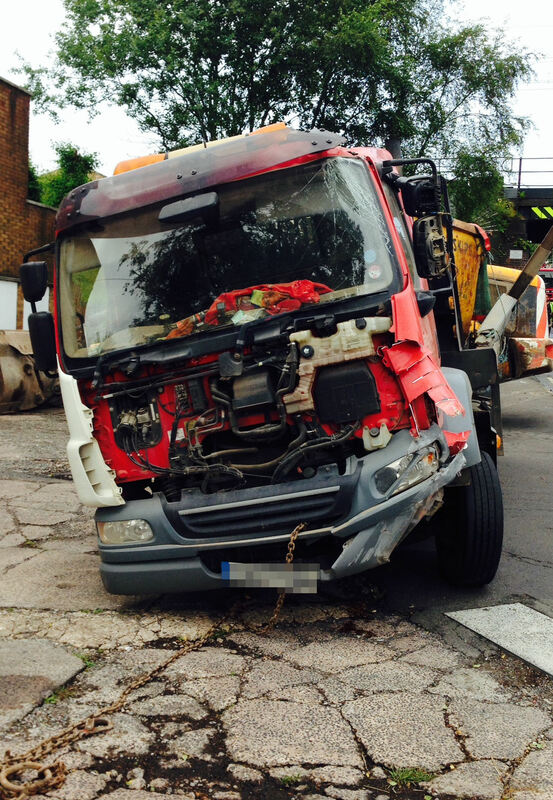 “The driver of the lorry, a man in his 30s, suffered a leg injury and minor injuries to his face. He was treated on scene by paramedics, given pain relief and immobilised with the use of a spinal board before being taken to New Cross Hospital for further assessment. Thursday 17th July 2013 – 4.30pm – Claire Brown. 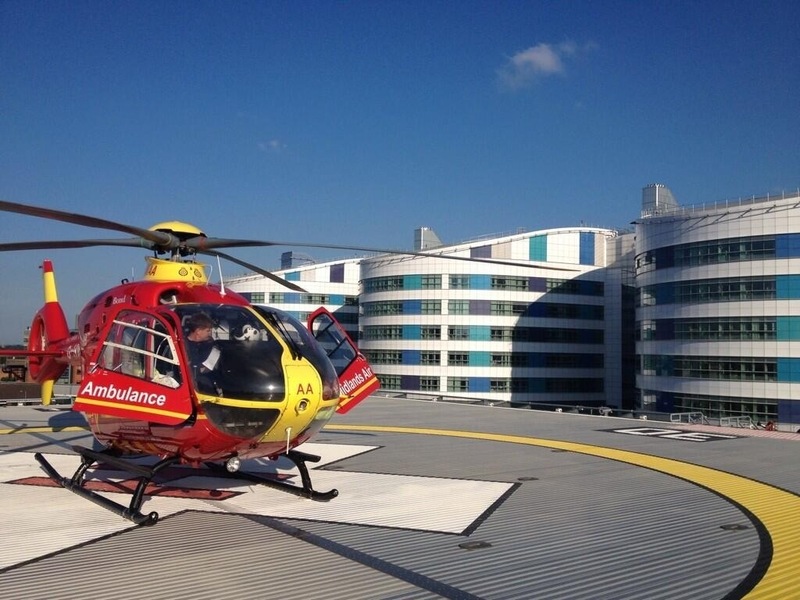 A motorcyclist has been seriously injured in a road traffic collision in Birmingham. 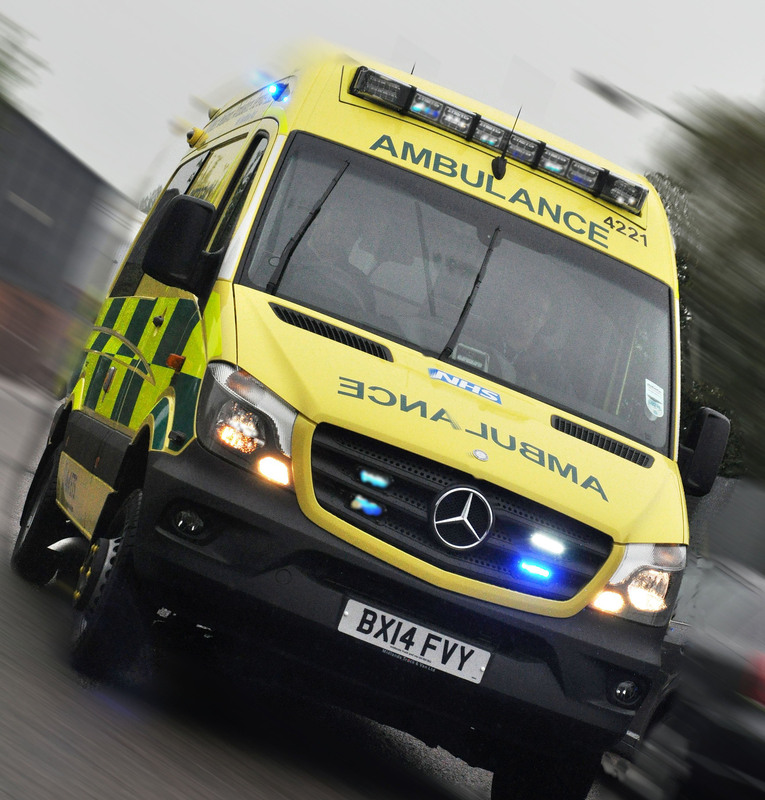 West Midlands Ambulance Service received multiple 999 calls to reports of a collision at the junction of the Tyburn Road and Kingsbury Road, Erdington, shortly before 2.15pm earlier today (Thursday). Two ambulances and a paramedic area support officer attended the scene. 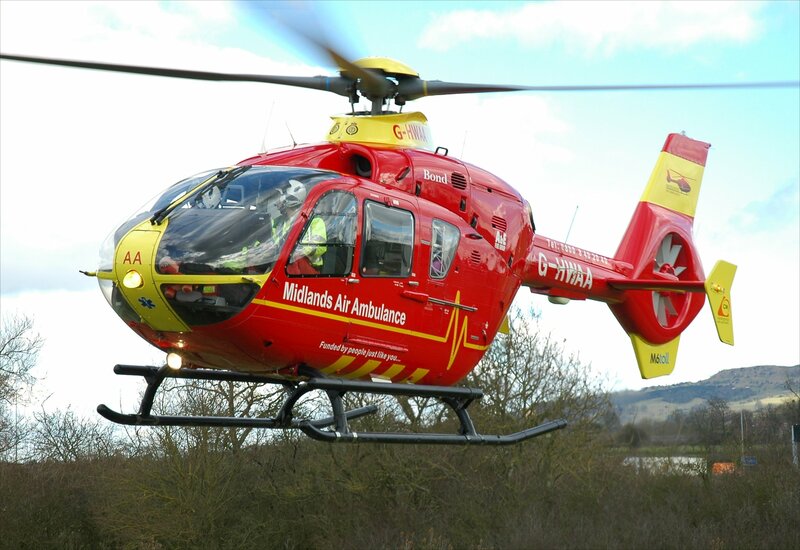 The Midlands Air Ambulance was requested but later stood down as it was not required. A West Midlands Ambulance Service spokeswoman said: “Crews arrived to find a car and a motorcyclist which had been involved in a collision. “The motorcyclist, a man believed to be in his 40s, sustained a fractured leg and a suspected fractured pelvis. Ambulance staff worked as a team to stabilise the man’s condition by administering pain relief before immobilising him with a leg splint, pelvic splint, neck collar and spinal board to prevent further movement. “The man was then taken by land ambulance on blue lights to Heartlands Hospital. Thursday 17th July 2014 – 10.30am – Steve Parry. High temperatures and long periods of sunshine are expected across the region tomorrow. West Midlands Ambulance Service is therefore urging the public to keep safe during this exceptional weather and use restraint in calling 999 for an ambulance. The ambulance service is bracing itself for another challenging weekend with heat wave alerts issued for Friday and the potential for heavy rain and thunder storms on Saturday. One of the concerns for WMAS is the number of calls to serious breathing problems. 999 calls to patients with breathing difficulties and chest pains generally increase with higher temperatures. WMAS medical director, Dr Andrew Carson said: “A heat wave poses a real danger to those patients with emphysema, asthma and long term breathing problems. “The hot weather makes breathing difficult even for healthy individuals. That’s why we suggest people with respiratory illnesses should remain indoors as much as possible. 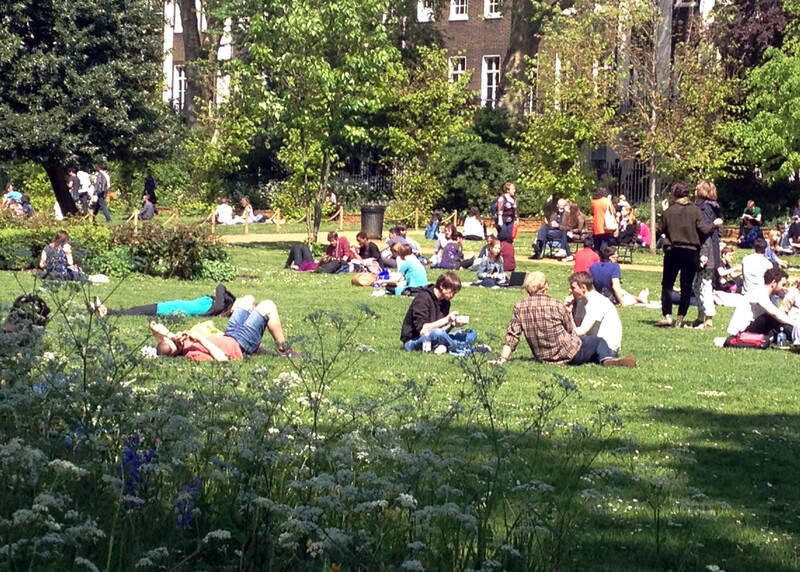 If you’re out in the sun make sure you apply plenty of sun cream, wear a hat and light, loose fitting cotton clothes. Avoid being out between 11am and 3pm, which is the hottest part of the day. Fancy a swim? Then please do so in a supervised swimming pool. No matter how tempting it is to cool off in rivers and lakes. The Trust has sadly dealt with a number of incidents in open water. If a barbecue is on the cards, please ensure that it is lit safely and in the correct manner. Avoid burn injuries by using the correct utensils and don’t let children play too closely to the hot barbecue. Lastly, please make sure that all food is cooked through properly to avoid any food poisoning incidents. If you’re taking advantage of the sunshine and are going out for a walk or hike in the countryside, please make sure you wear the appropriate footwear to avoid any slips or trips. If you’re planning on hitting the road for a trip away, make sure you’re prepared for your journey, take food and drinks and remember to break the journey up. If driving in residential areas, please watch out for ice cream vans and any children that may be distracted around them. We would also ask bikers to be careful and wear appropriate safety clothing. Equally we ask car drivers to look out for bikers, as the number of these on the road will be significantly higher when the weather is fine. Wednesday 17th July 2014 – 8.15pm – Steve Parry. Two men have been taken to hospital with serious injuries following a road traffic collision between Marton and Southam in Warwickshire this evening. West Midlands Ambulance Service was called to Sandy Lane near Marton at 6.45pm. Two ambulances; a paramedic officer in a rapid response vehicle; a community paramedic and the Warwickshire and Northants Air Ambulance were sent to the scene. A West Midlands Ambulance Service spokesman said: “Crews responded following reports of a collision between a car and light van. “A man in his sixties who was driving the car received multiple injuries. He was immobilised with the use of a neck collar and spinal board before being airlifted to the University Hospital of Coventry and Warwickshire. Wednesday 16th July 2014 – 7.45pm – Steve Parry. Three people have been taken to hospital following a road traffic collision near Warwick this evening. West Midlands Ambulance Service was called to the B4439 at the junction with the A4177 at Hatton at just after 5.20pm. Two ambulances; two paramedic officers and the Warwickshire and Northants Air Ambulance attended the scene. A West Midlands Ambulance Service spokesman said: “Three men were taken to hospital after a two car collision resulted in significant damage to both vehicles. “The driver of the first vehicle involved, believed to be in his twenties, was trapped for almost an hour. 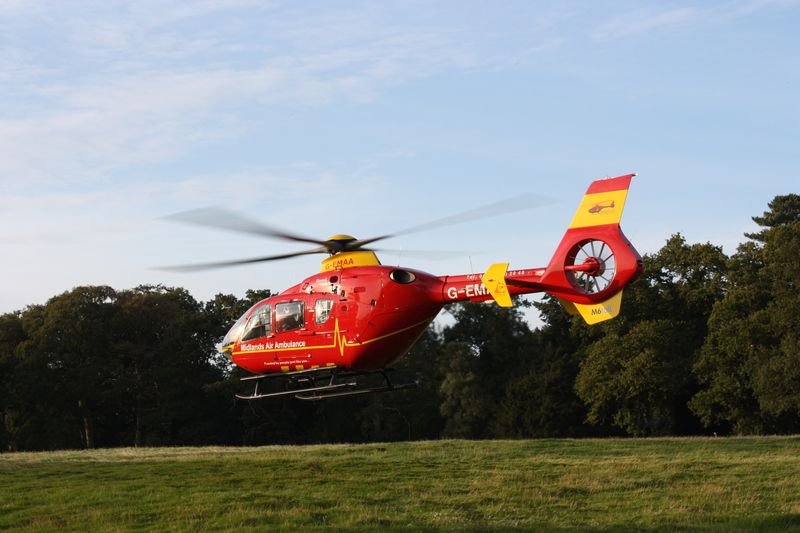 He received multiple injuries and was given pain relief and immobilised with the use of a neck collar and spinal board before being conveyed to the University Hospital of Coventry and Warwickshire by air ambulance. “A passenger in the car, also believed to be in his twenties was treated for a head injury and taken to the same hospital by land ambulance. Tuesday 15th July 2014 – 7.35pm – Murray MacGregor. 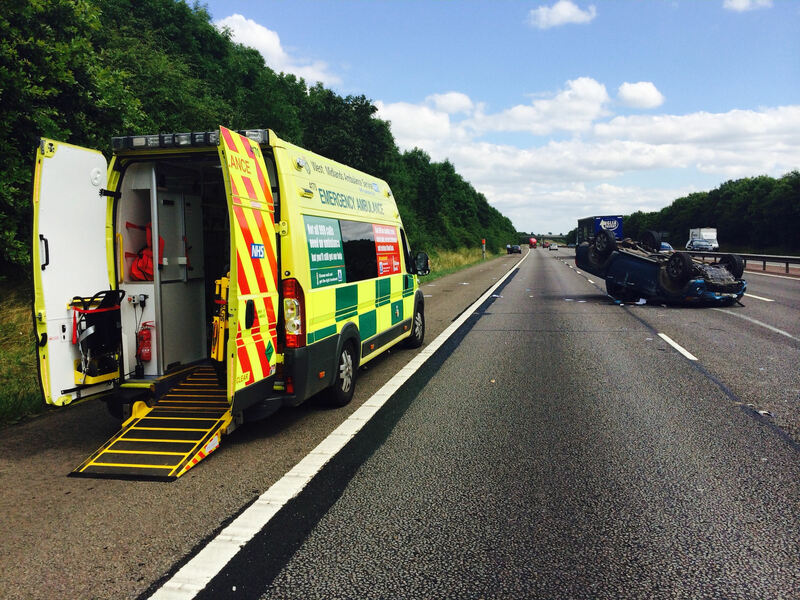 A driver has been exceptionally lucky to escape serious injuries after the ‘pick-up truck’ he was in, rolled over several times on the M40 motorway in Warwickshire. The crash happened on the southbound carriageway just before junction 11 at just before 2.55pm on Tuesday afternoon. A West Midlands Ambulance Service spokesman said: “Ambulance staff were told that there had been a collision between two vehicles which resulted in one rolling over several times coming to rest in the middle lane of the motorway. “The driver, a 47 year old man managed to get himself out of the vehicle, despite the roof being pushed down. “The man was complaining of neck and back pain but had no other apparent injuries. He was immobilised using a neck collar and spinal board before being taken by ambulance to the Horton Hospital in Banbury for further assessment and treatment. How do things compare between Hong Kong and the West Midlands? Very favourably. Tuesday 15th July 2014 – 5.30pm – Murray MacGregor. Two of the top officials from the ambulance service in Hong Kong have been visiting West Midlands Ambulance Service as part of a fact finding mission to the UK. 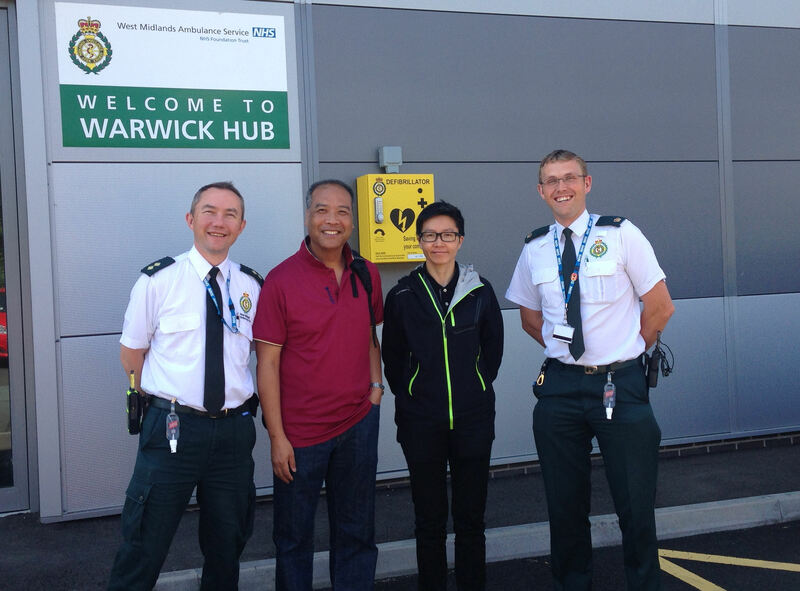 Shun Kwok-leung is the Deputy Chief Ambulance Officer for the Hong Kong Fire Service (HKFS) and together with Dawn Shui Ching Lee, who is the Superintendent of the Kowloon East Sector, they were given a tour of the new Coventry and Warwick hubs on Thursday last week. The HKFS has a fleet of around 350 ambulances and deal with almost 2,000 calls a day. The pair were in the UK visiting the Ambulex exhibition and conference at the Ricoh Arena to look at the way ambulance services operate in the UK and to see if there are any ideas they can take back to Hong Kong. Warwick Area Manager, Martyn Scott, who organised the visit to West Midlands Ambulance Service, said: “It was really interesting to hear more about the way that the ambulance service is run in Hong Kong and exchange ideas. “Our visitors were very interested to see the seamless approach within the hubs with regard to command structure, resourcing, training, operations and fleet. “We were able to demonstrate the high quality of cleaning, preparation and staff support that they bring. Pictured L-R Richard Dodd (Area Support Officer), Shum Kwok-leung (Deputy Chief Ambulance Officer, Hong Kong Fire Services Department), Dawn Shui Ching Lee (Superintendent of the Kowloon East Sector) and Martyn Scott, (Area Manager, Warwick). Tuesday 15th July – 4.30pm – Steve Parry. A motorcyclist has been airlifted to hospital with serious injuries following a road traffic collision in Bassetts Pole, Sutton Coldfield this afternoon. West Midlands Ambulance Service was called the junction of the A453 and Fox Hill Road at just after 2.35pm. Two ambulances, a paramedic officer in a rapid response vehicle and the Midlands Air Ambulance based at Cosford attended the scene. A West Midlands Ambulance Service spokesman said: “Crews responded to a collision between a car and motorbike. “A 17-year-old motorcyclist was treated for serious leg and pelvic injuries. The patient was immobilised with the use of splints, neck collar and spinal board. He was given pain relief before being conveyed to the Queen Elizabeth Hospital.